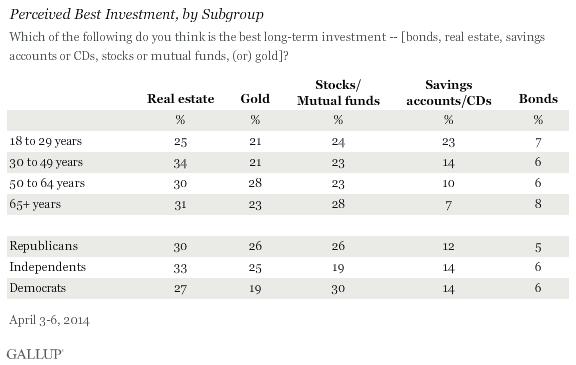 Lower-income Americans, those living in households with less than $30,000 in annual income, are the most likely of all income groups to say gold is the best long-term investment choice, at 31%. Upper-income Americans are the least likely to name gold, at 18%. Upper-income Americans are much more likely to say real estate and stocks are the best investment, possibly because of their experience with these types of investments. Upper-income Americans are most likely to say they own their home, at 87%, followed by middle (66%) and lower-income Americans (36%). 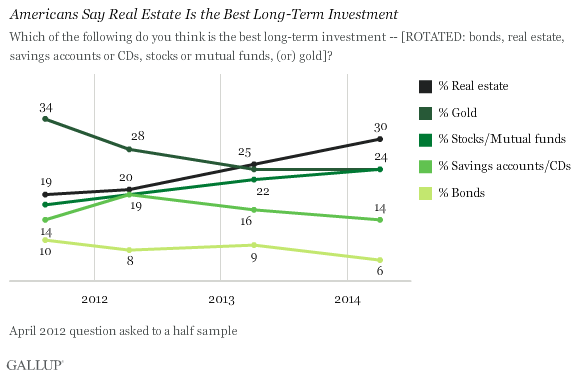 Gallup found that homeowners (33%) are slightly more likely than renters (24%) to say real estate is the best choice for long-term investments.